Is there still room for a landline? Image rights belong to the Science Museum Library, UK. We may feel nostalgia for out traditional telephone lines or what the industry calls POTS (Plain old telephone system) but is the world still in need for something so 20th century? Every year millions of landlines are being canceled in the US and Western Europe and in some places in the developing world they were never even installed. It seems that the world is doing away with wires in lieu of wireless or cellular telephony. Vonage and other VoIP (Voice over internet protocol) providers have given a bit more life to the traditional telephone but in some places cellular is the only phone. Why hasn’t it totally moved over? For a home installation the phone is supposed to ring throughout the house so you can pick it up wherever you are. 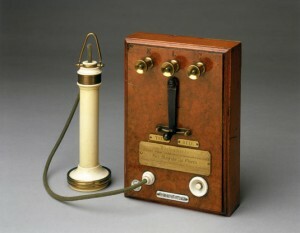 The traditional telephone industry came up with cordless to cut the wire, but it still rings in multiple places. The VoIP providers created the little boxes that you plug into you wall phone jack to “transform” your phone wires into VoIP phone wires. This way all your phones ring with a single number and you can still hook up things like your alarm, answering machine (not sure why you still want that), a fax machine (ditto), modem (seriously? ), etc. But the cellular providers have not done the same. Think about it. For example in the US if you have AT&T, Verizon, T-Mobile, or Sprint and you are on a family plan, you can add a line for $10 / month and all your calls within all numbers in the plan will be free (well, actually included) plus every call you make to at least 40 million people (within the network) or 70 million + 10 chosen are also included. So why nobody has come up with a little cellular box that you plug into your home phone wiring to make your home number another number of your family plan? If you can get a free phone from any of these providers you have to imagine that someone can build this little box. This “box” will make your home phone work like you’re used to. Why haven’t they done it is a mystery. Verizon has been advertising The Hub. Essentially a VoIP (Voice over Internet Protocol) phone not too different from your Vonage box with an attached cordless handset. It has the additional advantage of making it part of your Verizon family plan for “only” $35/ month plus a $200 entry fee. Sure it does things like the Chaperon feature that allows you to monitor where your kids are, it has a message center, picture sharing, etc. But when you can get the phone service for only $10 / month you’ll have to question yourself. Furthermore, you could use your internet service to duplicate the hub’s features if your provider gave you the app. It hardly looks like a useful device. So AT&T, Sprint, T-Mobile, or any other provider ask one of your suppliers to do “the box” so I can do away with my home phone. Give it to me for free, create an app over the internet that I can use to send messages and manage my accounts and you will make it a lot more difficult for me to move to a different network. Well, at least until they offer me the “box” and a free year of DirecTV. For enterprises, though it is even more puzzling. Why do PBXs still exist? We all carry cellphones, don’t we? Can enterprises outsource their telephony services to a cellular provider the same way they outsourced their shipping needs to UPS, FedEx or DHL? But this is a topic for a future post. Enjoy.